Jan in hospital for a few hours. We had a quiet and very warm weekend. Not really temperatures that invited us to do a lot. Today is much better, even a bit fresh, looking cloudy, it might rain a bit again. But from tomorrow temperatures will rise again to 77-82 F and a lot of sunshine. This morning we were up very early, because Jan had to go to hospital for his vasculair research. I went with him, because I know he was a bit nervous about it. It's not such a big deal, but he doesn;t like hospitals at all, and specially not if he needs to stay for a couple of hours. Well, I left him in good care there, I hope he has been picked up now to undergo the research. After the MRI he has to stay for 2 or 3 hours there, lying, to avoid a bleeding. The infusion has to go through the groin, there they will inject some contrast fluid into his vains. And then they want to be sure, after the MRI, that his vains closes well, and he will have no bleeding after it. Hope all will go well, and then he will be sensible enough to stay long enough on his bed LOL. 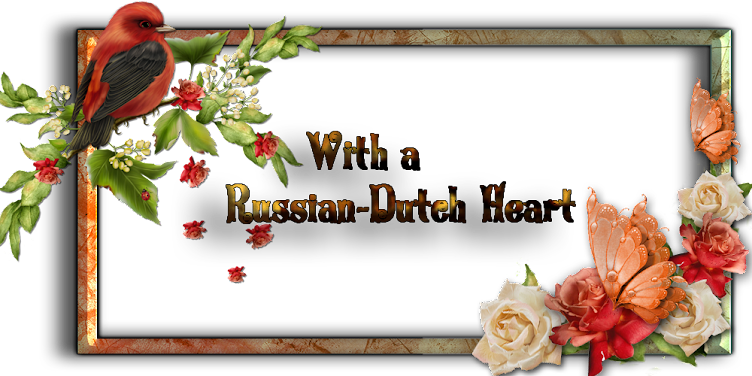 The news about the plain crash in the Ukrain is coming in in just little bits, they now know 193 Dutch people died in that crash. But But it is very difficult for the OVSE and officials to come near the crash place and do research on the bodies and the area and plain debris. All because part of that area in Ukrain is under control of the separatists. I just hope for all families involved that the bodies will be home the soon as possible and then there will be the research to do to try to find out who really is responsible for the crash. I am not sure if that will happen, but let's hope for the best. As I said, we didn;t do or moved a lot around in the weekend. We even didn;t spend that much time in the garden, because it was simply too warm there. Yesterday though it had cooled down a little bit, so somewhere in the morning I managed to vacuum clean the house(oh my, it needed to be done!!) and removed a few dust bunnies, and did a few other things. Being so warm, specially on Friday and Saturday, I thought it might be a good idea to make a potatoe slad for Saturday evening. I made a mish mash of things, like diced potatoe, of course, then apple, cucumber, sweet and sour pickles and chorizo sausage, some mayonnaise and also some olive oil, balsamico vinager, tiny bit of mustard, pepper salt and it tasted good! I had a left over from it, so we had that for dinner yesterday, together with a delicious roast pork tenderloin, and I made a fruit salad for desert with melon, nectarines and strawberry. I have a couple of photos, I promised you one of the new rose, sorry it isn't completly sharp, but you get an idea of the lovely color. And here the buckets and two smaller planters I bought last week, you even see already one in use for a tomatoe plant. And here our Brodski, perhaps comtemplaiting about something, or just spotting something moving? In a couple of days I hope to make a photo of our gladioles, starting to flower now, finally! 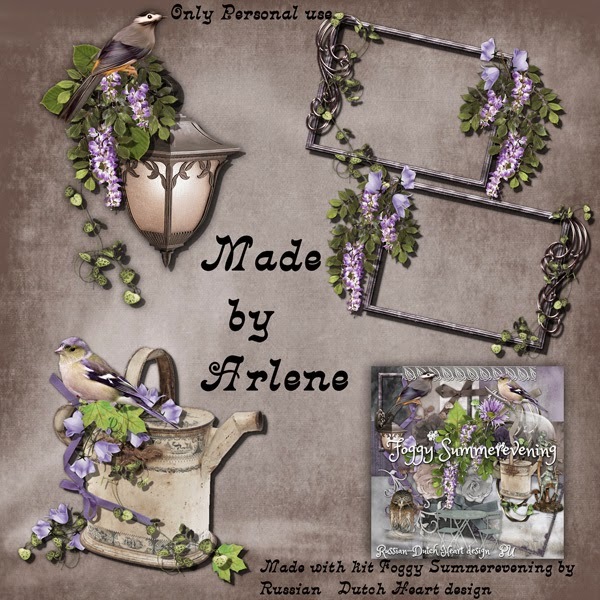 Your freebie today are the clusters Arlene made with the Foggy Summerevening kit. Will have to be a bit short today, because we have an appointment late today to attend to. We'll have to go to our insurance agent, to talk abouut a special insurance I have for my "pensionary days". At the time I lost my job at the business I worked about 9 years, we got a sum of money for the years we worked there, that was a special arrangement with the labour union. A part of that money I invested in a kind of insurance fund, and how miraculous, the sum has grown till now. I have no idea about what our insurance agent wants to talk about concerning this insurance, but as the first visit for this will not be charged(that already is a miracle these days LOL), we will go there to hear what they have to tell us. I am no wizzkid in financial things, neither Jan is, so we will have to be careful, and already agreed to sign nothing, or change nothing, it oly will be infomative and if they have suggestions, we will first think them over carefully. Sounds a good plan, hey? As the office is about at the other end of the city we will have to leave on time, so must be a bit short on posting. The last two days we didn;t do all too much, again, but Monday afternoon I thought it was a good time to visit town centre for a moment. So I did and found a few little things but I think the best was me spotting some nice buckets for a nice price. Hey, I didn;t buy them, but coming home and telling Jan about it he said: "why didn;t you take some home???" Now can you guess what I did yesterday afternoon? Yes, went back to town and bought us 10 uckets, as they were only € 0,99 a piece. They are of a soft kind of plastic, in all nice happy colors. You might thik, what we are going to do with 10 buckets??????? We will use them as planters! They just have a nice larger size, and the garden will look more hapy with them standing around and filled with all kinds of flowering plants. I think it is a good buy. If we use them as planters. we better make a few holes in the bottom for better drainage, but that is no problem. And we also can use them as "overpots"containing another pot with a plants or whatever. We already used one of them for one of our tomatoe plants that was almost growing out of its pot. Weather looks to be wonderful today, sun is shining and lots of blue sky, temps will be around 71 to 74 F, the days to come we will jump quickly into 82 to 84 F!! Might be that in the weekend there will be some thunderstorms, we'll see. Okay, must finish now, to have time to dress, to drink a coffee and have a sandwich before we leave. 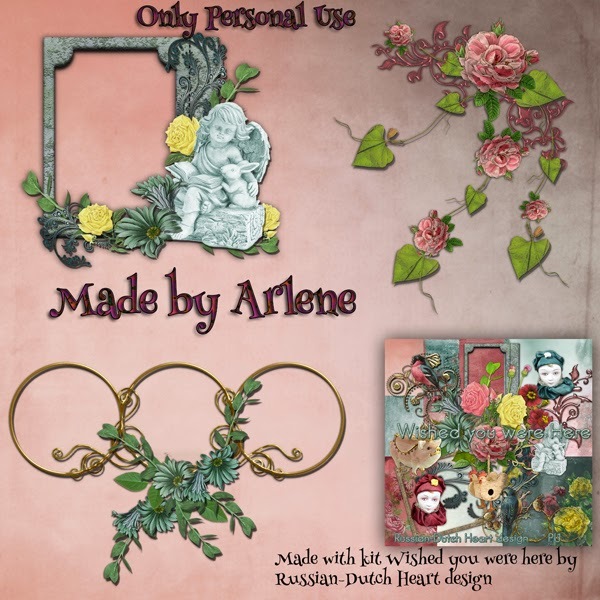 I promised you today the clusters from Arlene and so it will be LOL. She made you 2 wonderful clusters and a fantastic quickpage! All done with the soccer!! This weekend was the last of the soccer chamionship, where our team had to play for 3rd place. And they did it. So all doesn;t end too bad, isn;t it? Of course everybody wants to win and be world champion, but they still did well, I think. Then yesterday we watched the final between Germany and Argentina and Germany won. And I think, considering all their matches, that they deserve it. So suddenly we can watch again the "normal"programs on tv, LOL. We had a not too busy weekend, although some small things were accom;ished, a tiny bit more stuff has been organized here and there, yes, we are getting there. And I did some housework, which feels good to. Friday afternoon Jan went to the market, and came back with some fruit, among others, some little prunes. I cannot say they were a too big success, they are not as sweet as they could be. May be I better try to make some jam of them? But he also brought home some cucumbers and tomatoes, so definately this week we will eat a lot of salad LOL. Oh yes, he brought home also two steamed mackerels. Yummie, they tasted good, we had them saturday evening on some sandwiches. Yesterday, however I prepared us a real dinner(mostly Fridays and Saturdays we improvise a bit), and made a lasagna. That together with some salad, was a nice meal. As always I made a bigger portion, so we will eat it again today, easy peasy. I have a couple of photos of the garden for you, not yet from a rose I bought at a supermarket some time ago, but that rose starts to bloom so in a few days I hope to make a nice photo of the flower, it has a gorgeous color. Here one photo of a ground cover rose, that does well this year, it is full of little roses, only this year they disappear a bit because we planted the big dahlias in front of it, not knowing those dahlias would become THAT tall LOL. Definately next year we will have to find another place for those. Not too good photo, but you get the idea, the color is more red than it looks like here. Hee some tiny sweet little flowers, coming from a seed package with mixed flower, I think you could call them field flowers. And as last one of our busy lizzies, they do well, but it seems the growers had trouble with some diseases, so there weren't as many lizzies as usual. But our summer isn't the same without some busy lizzies. That about all for now, next thing we are waiting for is Jan's vascular research at the hospital. He isn;t very keen abut it, which I can understand, but on the other hand it's a good thing his doctor takes precautions and wants to rule out all risks, if there might any. Today the weather looks better, not too sunny yet, but further on this week we might reach temperatures 0f 28 C, that will be rather hot!. 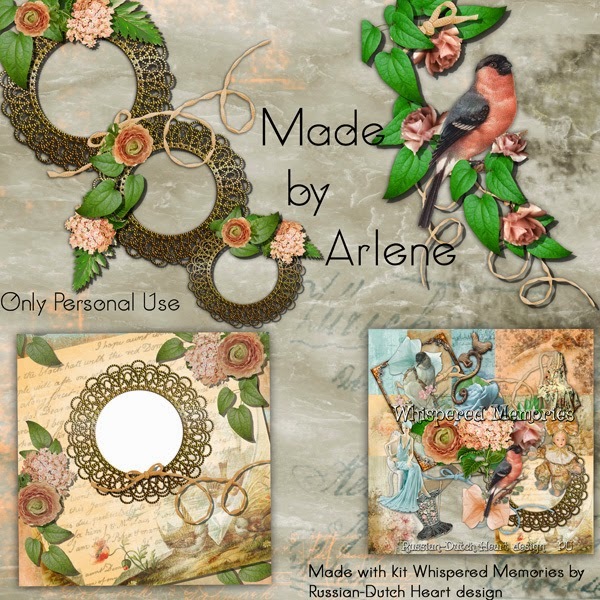 Now on to the second part of Whispered Memories., on Wednesday you will get Arlene's clusters. I even did some more designing, am busy with another kit. May be I will find some quiet and the right mood today to finish it. Not to imagine how the weather changed over a day! Wednesday it was raining almost all day, temps around 60F, and a hard wind blowing. So I didn't go to the bak, just did a quick shopping tour om our neighbourhood, and that was all. Perhaps the weather was crying already a bit for our soccer team. It had to play that evening their smei final against Argentina. And they lost it. It wasn't a very good match, not from both of the teams, and it ended up in a decision by penaltiesand yeah, we've lost that. Pity, but perhaps a bit their own fault too. I think they didn;t play offencive enough, but okay, the final of the WC soccer will be between Germany and Argentina. Yesterday morning I woke up with sunshine, blue sky with white cluds and temperatures that rose to about 71 F and even higher in the sun in our garden! Amazing change. Got a phonecall of my friend Heidi, that she wanted to come along in the afternoon, so my plans for the day were gone. Did I mind it too much? No, not really LOL! We had a nice chat in the garden, and it was good to see eachother again. After she went home again I did a little bit of repair in the garden, some tall flowers needed a stick to keep them up, also removed some dead flowerheads, and took a short nap too. This morning it is looking a bit grey at the moment, but later on we should have sunshine again and nice temperatures too. I have a to-do list for today, must go to the bank for the bills, then I should do a vacuum clean and a laudry and if I am still in the mood, I might do some ironing too, but also could be that Jan and I will go to the market. We could do with some fresh fruit and some veggies. Soon Heidi will go on vacation and she asked if we could look after the fish they still have and the post. Of course we will do that. We only need to go there every other day or so, and we can divide the visits, one time Jan and another time I will go. I shouldn;t forget to ask Heidi to bring me some French cheese(as she is going to France). Of course we can buy it here, but it isn;t just the same. Last year she brought me some and it was delicious! 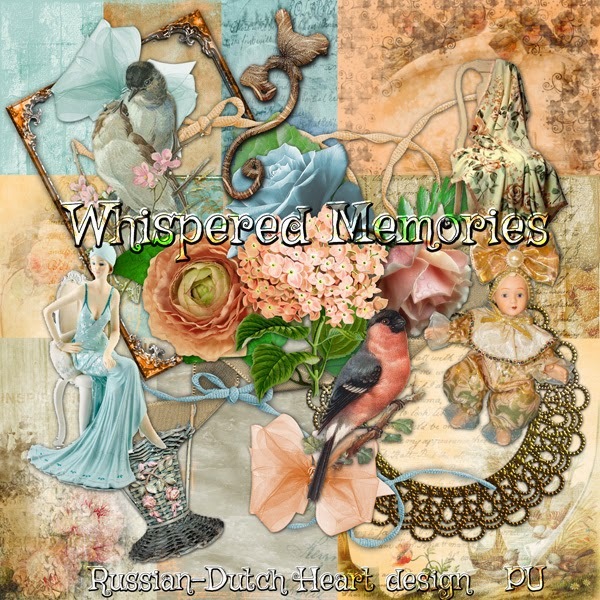 Today we start with a new kit Whispered memories, this will be the 1st download, Monday part two and then some great add-ons from Arlene later too!! May be next week I will have my sweater ready, I can do with a couple more, so I will see if I can find another nice color for the next one. 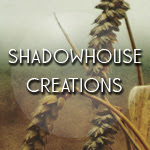 I am getting a bit better making them, it is all about doing it a lot and learning a some of your mistakes LOL. And if I want to do a bigger project again I could start on a smaller throw over for the smaller couch, in the same color of course as the big one. Hmmmm, perhaps a good idea. Okay, plenty to do today and in the weekend we will try to enjoy good weather in the garden and may be take a little walk. I think next month we could go picking some blackberries, who knows? We have some free space, can you imagine??? First we had to deal with Jan's appointment at the hospital for results of the scoop and MRI. Scoop all fine, but his doctor wants him to have another MRI for his intestines. She wants to know for sure his vains there are still working fine and aren't narrowed a bit. If this might be the case, Jan might have to undergo a vascular angioplasty, to provoke any problems in fuiture. His doctor is very careful with him and wants to be sure all is still going well, so it isn;t said it is already the case. Hmmmmm, of course he isn;t all too happy about it, neither am I, but on the other hand better it is checked now, if his doctor has only has a slight presumption. Let us hope that extra MRI will prove her wrong, and that this angioplastry will not take place. In the afternoon we gathered all the things we wanted to put on the street, and in the evening we placed it at the sidewalk. Gosh, suddenly the garden and the hallway were rather empty. Tuesday morning the van came by to pick up all the stuff. In early afternoon I went out for some grocerie shopping, and I was lucky, cause it almost didn;t rain at that time. Yesterday I did some more organizing in the backroom and the extension. Almost everything has it's place again, and can you believe it? We still have place in the new racks LOL! Jan ordered me not to be over-enthusiastic, soon enough it will be filled, but we should try to avoid that a bit. Hmmm, I wonder if that will be possible. still some stuff should be re-arranged, and then it is easy to use those rack-shelves. But we are happy at the moment we took that decision, to first have repaired the floor and get rid of most of that enormous closet and that we ought those racks. The last two days we have quite a lot of rain, not really pouring but steadily going on almost all day and evening. Today should be the worst day of the week, mostly because we have a lot of wind, also some rain, looking rather grey outside. Oh well, we can live with that for a day or two, next days temperatures will go up again for a couple of degrees, and it will be dryer, although some rain showers still could fall. Not all too bad summer weather, because sunshine is expected too. I think I will be a brave girl, and go out ayway today, some bills have to be payed, so i will bring them to the bank. I will just have to pick out a dryer moment. That's about all the planning I have for today, but I am sure time will fly away, as it usually does. May be I even will take out the vacuum cleaner, or I could do some ironing, all not my favourite occupations, but once started, quickly done. 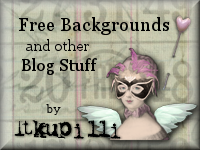 Let's go on to your freebie. 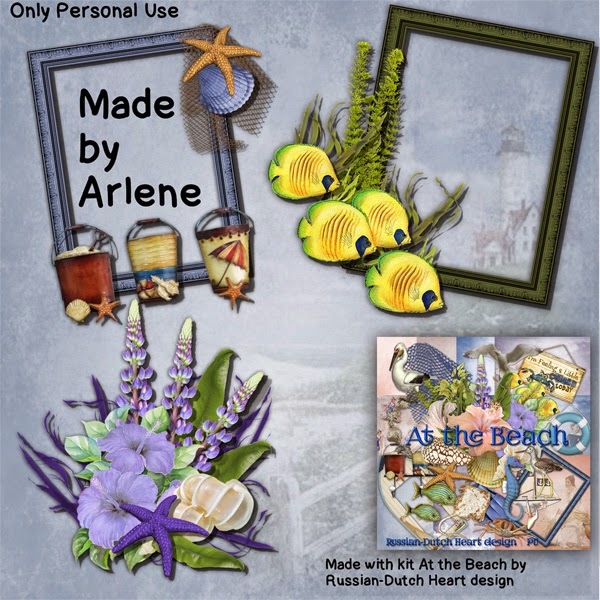 Today I have the clusters from Arlene, made with the At the Beach kit. Last day to collect our rummage! Gosh, I am so happy with those new racks in the backroom! It gives us a lot of space to put things away, and get them off the top of the closets. Today we still have time to go through some things and decide if we still want them or not and then we will have to put all the stuff outside this evening, where it will be collected tomorrow morning, hoorray! The weather has changed a little bit, mostly the temperatures. They are a bit lower than last week, but as soon as the sun comes through it is real nice. We had some more rain, but most of it during evening and night, all plants in the garden were dancing from happiness LOL. I also cleaned out the little pond and it is always a surprise to see what comes out of it when I pour the water out of it. Suddenly you see umping around 5 or 6 little froggies! Yes, they've found the bigger pond and are quit happy with it. Must be careful when I walk in the garden when it is dark, I do have to take a torch with me, because I always encounter a few froggies and toads, and I dont want to step on them! I will have to keep an eye on the clock this morning, because I will have to wake up Jan earlier than usual. He has his appointment with his doctor at the hospital to talk through the scopie and the MRI. 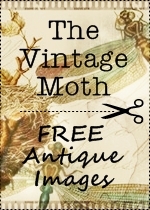 That's about all for today, seems not much happening, but we are spending some time on the rummaging and in between also some usual housework has to be done, so time is passing quick these days. But it is a good thing to keep a bit busy and that keeps the body a bit awake LOL. 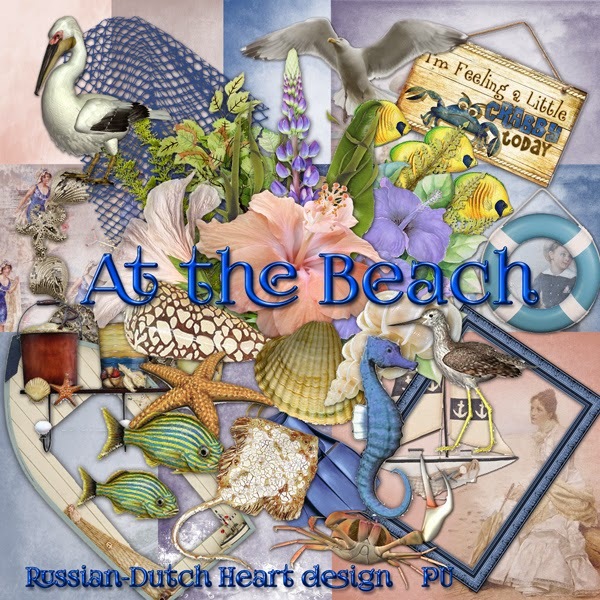 Here you have the second part of "At the Beach"kit, next time I will have Arlene's clusters for you. Have a wonderful day, and till Wednesday!